The movie Twilight came out when I was eighteen years old and still in high school. I was entering the penultimate semester on what was my school career at the time and there were basically two opinions of the movie (or the books for that matter) at the time: You either loved it or hated it. I was in the "hated it" camp. To date I have never really watched Twilight. When someone brought the movie to school and my economics teacher put it on I opted to watch Pineapple Express instead on a friend's laptop. Obviously, this was at the very end of my high school tenure and everyone was fairly lax about this behavior. I've never been a big vampire fan, partly because of Twilight. I guess the same could be said of werewolves for that matter. I enjoy a lot of the classics, but the new blood has left me wanting. I approached A Werewolf Boy because it was a Korean movie without really thinking about the likes of Twilight. Or even werewolves. I couldn't think of anything else to do and I didn't really want to watch a werewolf movie, but I basically said "screw it" and did anyway. I knew it wouldn't be a horror movie, though. That much became apparent within the first five minutes. I was not even close to a horror movie. That left only one genre: the Twilight genre. I almost paused and stopped everything right there. Then I reminded myself of how I had yet to see a bad Korean movie. This would be my 26th Korean movie and there's just no way my good Korean movie streak could end like this. This movie had to be good. I was staking my personal pride on that. So I watched on ever fearful that I'd see glittery werewolves. An older lady receives a call about her old house. She's been living in the US, but returns home when someone inquires about the sale of the property where she spent her youth. The best years of her life are obviously behind her and seeing her old house for the first time in years sends it all home. The sense of hopelessness and depression is strong from the start. I knew things were going to get melodramatic. Something happened there when she was young. 47 years ago in 1965 she met a boy that had literally been raised by wolves. The supernatural element of this series isn't really played up until later in the series. The main part of this story is more of a coming of age fish out of water type of thing. Sun-yi trying to teach the wild boy how to write, speak, play ball, and not eat everyone's food is all neat. There's a real whimsical feel to the movie at this point and some good laughs, too. It's only later on that we discover this boy that had been raised by wolves is also a werewolf. The title obviously gives it away, but something more subtle like The Boy Raised By Wolves would have been better. The werewolf's appearance and transformation could also have been better (it wasn't glittery, but he could've passed for an anime character), but I'll forgive those since the rest of the movie was pretty good. The bad guy in this film is one you'll hate. Definitely. You'll cheer when he gets what is coming to him. Sort of. The cast of this movie are a bunch of relative unknowns to me. 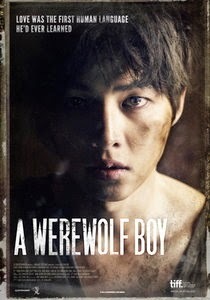 All in all, everyone does a pretty good job, but Song Joong-ki steals the show as the wolf boy despite having almost no dialog for the entire movie. This is a pretty good movie and my fears weren't really warranted. A Werewolf Boy may be a bit on the lovey-dovey side of the monster movie camp, but it is incredibly well done and worth watching. Which is more than I can say for the Twilight movies.